Dazzling Designer is a Premium Responsive Theme especially created for Designing Niche web blogs and websites. However, it also suites perfectly on Technology, News updates, Business, Gadgets and Top 10s (List based) websites. It has a Sticky Floating Header, Navigation Menu and a capsule search bar. It utilizes CSS, CSS3, HTML, XML and jQuery. The design of this Blogger Template is extremely efficient and also has plenty of customization options. The Dazzling Designer Blogger Template is compatible with all browsers and has crystal clean code/documentation. Floating Sticky Header: It has a Sticky Scrolling Header that automatically scrolls at the top of your screen whenever a person scrolls up or down the page. Another significant thing about our header is that it automatically resizes your Image Logo accurately to fits the dimensions of the Header. Thumbnail Related Posts: In this theme, we have added a Thumbnail Related post widget which would work on automation. The Thumbnails are of normal size so it could easily be seen by the readers. Ads Ready: We have added some HIGH CPC Advertising spots in this blogger template so everyone can easily improve their online income. Some featured advertisement spots includes, One ad Below the Header and One ad Above the Footer. 2 Column Post Display on Home/Static Pages: Unlike, other Blogger Template, this theme has 2 column post displays on static and home page. It means two different articles would display in 2 columns one after another. If anyone is confused then, he can view the DEMO to remove his confusion. Capsule Sticky Search Bar: The search bar of this theme is outstanding because it works on Hover techniques. Let us learn how it works. It displays a Small rounded image, now whenever a user would click on that image it would display the entire Capsule bar. Does that sound interesting? Indeed. More Features: SEO Friendly, WordPress Look, Web 2.0, Magazine Style, Static Home page, Fixed Width, Light Blue and White color Scheme, threaded commenting system, 4 columns footer and much more. This theme is extremely handy for Graphics, Technology, Multimedia and Gadgets niche websites. Our Designers are quite sure that no one would have seen such sort of Template before on Blogger Platform. However, it is just beginning some truly marvel themes are scheduled for the coming weeks. Don't forget to leave your comments and suggestions below. one of my the Best Blogger template Now :)Awesome Faizan bhai,,, Best of Luck!! Thank you very much for this superb template..I added to my blog Brief Tutorials.com, Now i'm facing a problem.. When i insert jump break it shows extra "read more" link.. I can't stop inserting jump break because my blog contains too many images (If i remove jump break, In my home page blogger will display only 6 or 7 posts).. So please give me any way to hide read more link from my template..
We have gone through your All Page and still we are unable to find any kind of Read More Link. However, to Remove Readmore do as follows. Once you Find the Skin TAG, just above it Paste the Following CSS Coding. It would hide the Read more button. Thank you very much for your help.. But now i'm facing a new problem..I selected to display 10 posts on my home page.. But it's not displaying orderly..Please look at this screenshot- http://bit.ly/10zEl4P . How can i display posts as series..
Thats Wired Error. I guess its due to your content. Try to show 8 or 6 Posts on Home. That might Resolve the issue. Up to 6 posts in home page, there is no problem at all, but when I select more than 6 posts it shows the same error again. any solution...?? I Guess your old theme might conflicting the coding.. I need one more help.. Can you please help me to remove Author name+ FILLED UNDER (Categories) from post page.. Thanks! it looks like a wordpress theme! this is the exact template I was looking for to re design my blog... many thanks! Btw... How can I remove related post? Because I am already using Nrelate. To Remove Related posts do as Follows. I have one problem, whenever I put adsense below post title something happens... the post title "title" went missing, if I remove the adsense it appears again. Since, Post Title is in Absolute position. This could be the reason why it gets hide under the header whenever you place the ads below post title. Because, we already have a featured Ad spot below header. This is the reason why we didn't included the below post title advertisement functionality. We have also seen that you are using Social Share buttons below post title. Try to replace them with the Ads. It might work. 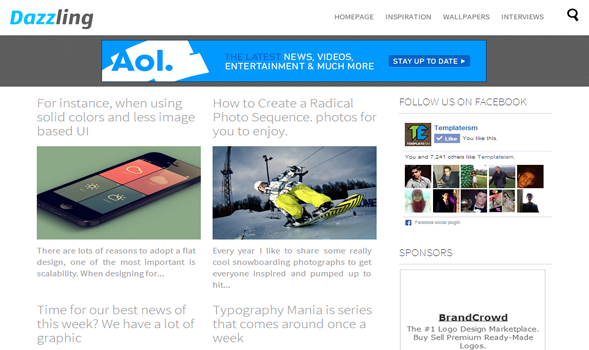 The Theme automatically Re-sizes the Header. Our Logo is Appear bigger then yours because we have used just one word i.e. Dazzling. While yours consists of two words and has more characters. now how can i make it bigger? It is just the image of same size as your then why the script is resizing my logo. And According to your needs Increase the Width and Add your Custom Height. Hello, thank you for this beautiful template. I'm experiencing the same error as Sebin Thomas, there is a break in the displaying of posts on the homepage, I've noticed that the break happens in different points depending on the screen resolution, at 1280x1024 the break is on the second row, at 1366x768 the break is on the forth row. If you could give another look at this issue we would appreciate. Try this out and let me know if this works. At ".posthomer" I add "height:350px" , this makes the height of the posts on the homepage fixed and stops the breaks, it's not very elegant but it works, people doing this might want to play with that value depending on the size of the post titles they usually have, the longer the titles the bigger the number they have to use. Thanks again for this template. helo! I want to find where i can put code for title post in center. show mys site www.zequetto.com . thank you! We Checked your site and the Post Titles are already in Center. I Guess you resolved the issue. Soon it will be Switched to .com .. as soon as its Customization is completed..
Also, can you say me how to change the font Color of Search Box ?? One more help, How to add Sub-Menu Inside a Sub-Menu ?? As Per your Second Question. Well This Menu doesn't support Multiple Drop Downs. Back Again, I Have one Query.. Can I change the BG Color of DropDown Menu ..
To Change the Background Color of Drop Down Menu Search for this CSS coding in your Theme. Replace the background: rgba(255,255,255,.9); According to your needs. Sorry but it Didn't worked.. Can you help me out ? What I did is... I added "background:#262626;" in "ul.menu li" & it worked.. Sorry i need help in one of my blog i use an another language if you can please tell me how can i change the comments from left to right side. Hello admim...i just uploaded your template & i am having an issue in blog posts..here is my blog http://android-for-free.blogspot.com/ you can see there are gaps between my posts..please tell me how can i remove that...!!! At ".posthomer" add "height:350px" and it will stop the breaking. Please help me. I use this template. Why my blog automatically lead to http://www.templateism.com, ..? If you want a Credit Free Theme then you have to purchase a License from us. How do I buy a license you ..? If any of them Use IE .. the Site Redirects to your Site..
On IE the site doesn't open & directly redirects to your site.. Need Help on this problem..
We checked your site and its working Fine. IE don't redirect us to anywhere. Cheer cookies. Which IE version you are using? Actually when I tried to View my site from my College PC .. then I used IE6 .. & it redirected my Site to Yours..
And we don't support customization. I may order one template as dazzling but with a few modifications to make it look different from the others? at what price? We usually Charge in Between 50 to 150 Dollars. Depends upon the Customization that you need. please immediately hear from you. I actually love this dazzling templates. but I want to change some of the color of the template to make it look different. Because I was confused whether I create a new template or use it just to change the color if it is allowed ? to the design team how to hide the title and description on the blog header dazzling? because I want to replace with a logo that I created. Thank you. I have a question: how can I add share buttons in my blog? It doesn't work. i want to customize the width of the black thin at the top and bottom how can i do it please reply..? Very Awesome one Jnaab Fantastic Job..
iam not able to add socialize widget like urs in this help me please! Follow the Steps mentioned in the tutorial. Yes you can add more than 1 Drop Down menu. Use the Gadget Area under the Header to add anything on that Strip. @designer Team . How Do i Add More Drop Down Menu's . Please Guide Me Through The Process , Since i AM Little Noob In This Things . And What Are The Dimensions For An Replacing The Black Stripe With Image ? Thanks In Advance . Sorry we don't support customization. I want to use this awesome template for my blog. I tested it on my blog to check it's functionality. I added sharethis.com buttons for posts. Buttons are apearing at post thumbnails along with at the end of full posts. I don't want them to appear at post thumbnails. Can you please tell me how to do this? How do I leave with 1 post on Home/Static Pages ? summary_img = 0; but it still showing first word of the summery. please help me.